OK, So you've seen me say that what I do with my pen & ink is a "stippling technique", but you don't know exactly what stippling is. So you're here at this page hoping to learn a little about what it's all about. Ok, fair enough! I'll tell you what I know about it. Stippling, put to its basic form is using dots to make an image, or at least as much of an image that dots can make. The dots are of various sizes and spacing apart so that they convey light and shadows to make the eye "see" what it is that the dots are forming. There is, of course, no real image there, just an arrangement of dots. Yes, I put them on the paper one at a time, though usually pretty quickly in the same area. Creating the degree of depth is the biggest challenge in this type of work. There are no areas of gray in a stippled drawing, as the illusion of gray is made up of varying densities of dots. 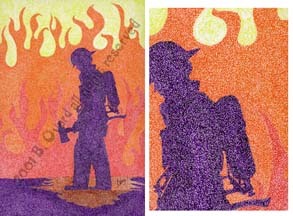 Stippling typically refers to pen and ink or pencil, where a single tone or color is used to create art. It is a close relative to pointillism, which is the same technique but employing multiple colors, and is usually paint. I first sketch a drawing or design lightly in pencil on white paper, usually either Twin Rocker or Fabriano Soft Press paper. I have used parchment, and recently have been experimenting with paper I make myself. Then, slowly and carefully, dot by dot, the black image is built up. Traditionally, the pen is dipped into a bottle of india ink and each dot is deliberately placed to attain subtle shifts in value. I find that using the bottle method is awkward and can lead to an uneven size of dots if you don't do it with extreme precision, and care. This works well for small drawings, but on the larger drawings that I do, it would take entirely too much time. As it is now, it takes anywhere from 20-100 hours, and the time would tripple if done by dipping the pen each time. Each drawing also has anywhere from 500,000 dots up to and over 10 million, depending on the size and detail of the piece. I use Micron by Sakura pens that have a nib that stays a consistant size, has superb quality india ink in them, and are consistant. I only use the materials that I use because they are of the highest quality, and I am very demanding in my art supplies. I absolutely will use nothing but the best. As to the history of stippling, the technique was first invented in the 1500s for engraving, and later adapted picked up by pressmen as a way to transfer photographs to newspaper images, and to a degree this same technique is used today. 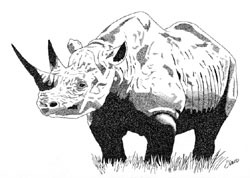 Stippling is the manual forerunner of Benday dots and halftones. But halftones are used much anymore because of the use of digital graphics programs. You will sometimes hear the term "pointillism" used to describe stippling, but pointillism is normally used when the artist is using brushes and paints. The french artist, Seurat is famous for using pointillism. Stippling can be done with any colour ink, and with some of the high quality inks coming on the market, I am starting to incorporate more colour into some of my pieces where I can. In some of my drawings I also incorporate other media, such as graphite, to help set it off, and I think this works well. As to the future of stippling? Who knows?! It is a technique that requires the artist be in touch on almost an intimate level with the subject and the materials that he uses. The artist must know the limits of the paper, and the ink, and the pen. He must know how a certain group of dots will look when they are placed on the paper. He must know how that paper will act with the ink being that is being placed on it. He must know every inch of the subject, because he is trying to orchestrate a grouping of ink dots to portray that image. If you have any other questions about this technique, please feel free to drop me an email. All art on this site, Copyright 1985-2008 B. Ovard All rights reserved.